Smart driver in the car who pulled back from overtaking. Was stunned to see the bike after having to jam on the brakes to avoid getting crushed, just change lane and drive off without a care in the world for the truck driver. Maybe he had an urgent appointment with the toilet after that one. No one here ever seems to want to go to the vehicle involved in a crash to see if any help is required. No one ever seems to stop? Nevermind about the driver is/may be hurt needs help etc, nooòooo not my business just drive on !! Perhaps the driver could not contain himself . Speeds not excessive, curve not that sharp. Did the driver simply oversteer? I know this sounds awful, but on a number of occasions when having seen accidents, the Thai with me has told me specifically not to stop. They seem worried the driver might try to make out that I, as a ferang, caused the accident, maybe walking into a scapegoat situation. Truck taking the corner too fast, must have been a full load too....result ....boom of the right rear tyre compounding the inevitable! Good chance his load was top heavy. So the weight shift + curve + speed + crowning of road against him (road leveling angles downward to the right, but road curves to left). Not sure why the civil engineers did that part of the road that way. You would normally crown it with the curve, to give drivers an additional advantage. 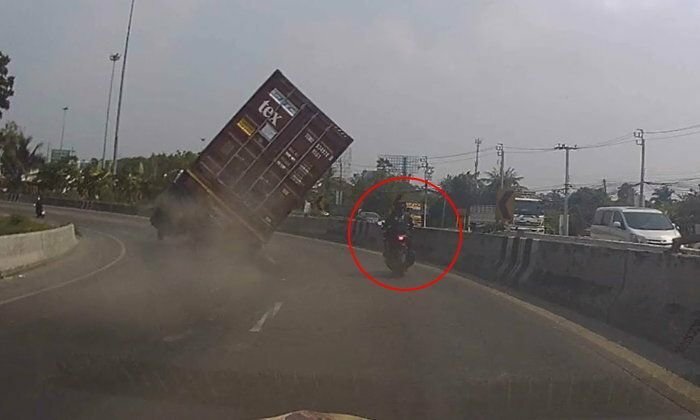 The commercial driver should have slowed down a bit and not pretended he was driving a car. OK, last visit here about 9:00 at night, I witness a taxi cut to the outside lane and slam on the brakes right in front of a motorbike who then smashed into the trunk. Mid-20’s female riding pillion gets slammed to ground and is unconscious. Maybe 30-year old Male motorbike operator immediately goes up to unconscious female and starts shaking her to “wake her up” and as she continues unresponsive, he starts dragging her around by her arms. Being an EMT, finding an unresponsive subject on hard pavement after a vehicle collision, the first concern after making sure no cars may run us over, is to stabilize the neck and assume C-Spine injury and avoid moving the patient except to roll them on their back and to look for additional trauma such as bleeding or compound fracture. So I don’t attempt to touch the female but do talk to a 3rd party Thai male to communicate to the motorbike operator that its not good to move her like he is. Next thing I know the motorbike operator decides its time to fight the nosy farang...ME. Fortunately, a couple Aussies saw the whole thing and moved quick enough to encourage my hasty retreat. In Canada, I am an EMT first responder trained to help others. looks to me like a tyre failure on the trailer, you clearly see the leading tyre blow then another shortly after, you can only retread these HGV tyres a limited number of times, the casings must be in good condition otherwise they will fail - anyone think safety is number one ? Agree with you mate, tyre blow out caused the load to topple, it is clear in the video. The car driver was apparently duly protected by the magic papers on their dashboard. The dash cam car also went merrily along his way, seemingly without a care for the truck driver. One lorry did pull up though. We did see one lorry driver pull up.